Looks like Samantha Shannon is taking a little departure from her usual work with this upcoming epic fantasy novel, and to be honest, since I’m not really feeling the The Bone Season series anymore with its weird mix of paranormal and dystopian vibes (I haven’t even read the latest book), I’m kind of curious to see what she will bring instead to my favorite genre. 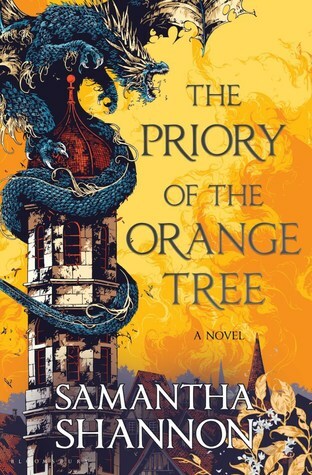 At almost 900 pages, The Priory of the Orange Tree is going to be quite a tome, which admittedly makes me feel a bit intimidated but also excited at the same time. “From the internationally bestselling author of The Bone Season, a trailblazing epic fantasy about a world on the brink of war with dragons—and the women who must lead the fight to save it. Yeah, I find that orange covers are rare, but this one does it for me! Been seeing a lot of hype for this one. Oddly I feel like it might not be my kind of read. Even though I do love my fantasy reads. I hope you will thoroughly enjoy this one once you get to read it! Yeah, I’m very curious to see where she will go with an epic fantasy series! Trail blazing eh? Well, I guess you are in for a ride of a time then! Wow this looks and sounds awesome. And that cover! Awesome pick this week. Omg I’m so excited for this one as well!! All the pictures of the people who got this beast of a book make me drool for it! so big! Yeah, I feel the same way about her Bone Season books. I’ve slowly just lost interest. Hope this one will be more to my tastes. That cover is AMAZING. But I really didn’t like The Bone Season very much, I feel like that series just sort of disappeared? And 900 pages, it would have to be exceptional for me to devote that kind of time to one book. She’s still writing Bone Season, but I feel like most people aren’t that into it as much anymore. I had no interest in The Bone Season but this . . . this looks awesome. There be Dragons! Sign me up! I read the first two books of the Bone Season, and I DID have plans to read the third, though more and more I’m doubting I will ever get to it. Ohhhh…so this is the author who wrote The Bone Season? I haven’t read any of her books yet, but I have been seeing the hype for Priory everywhere, so maybe I’ll check it out sometime. 😛 By the way, this cover is absolutely stunning! Yes, it’s the same author! That’s why I think most people are hyped or at least curious about this one, as it seems to be quite a departure. Yeah, I was curious where the hype came from; you don’t see adult fantasies being as hyped much, so I thought it was a bit odd. 😛 Makes sense now! The description, definitely. Sounds like a rich epic fantasy. I saw a pic of the ARC for this one and my eyes nearly popped because I was NOT expecting it to be so thick. 😀 And I can’t properly express how much I love that cover. That color scheme–UGH. That cover is great – really eye catching. I read the first two in the Bone Season – not sure where the series is now up to or if I’ve fallen behind (probably). Haha, I’m the same way – read the first two books of Bone Season, pretty sure there’s a third that’s out now, but I’ve kind of lost interest. That is a beautiful cover…very striking!